ROLLING MEADOWS, Ill., Feb. 16, 2011 -- Northrop Grumman Corporation's (NYSE:NOC) facility in Rolling Meadows recently hosted a reception honoring the parents of 15 students participating in its WORTHY (Worthwhile to Help High School Youth) mentoring and scholarship program. Designed to encourage and advance program participants' pursuits of technical degrees, the WORTHY program provides work experience and improved access to secondary education to high school students in need. 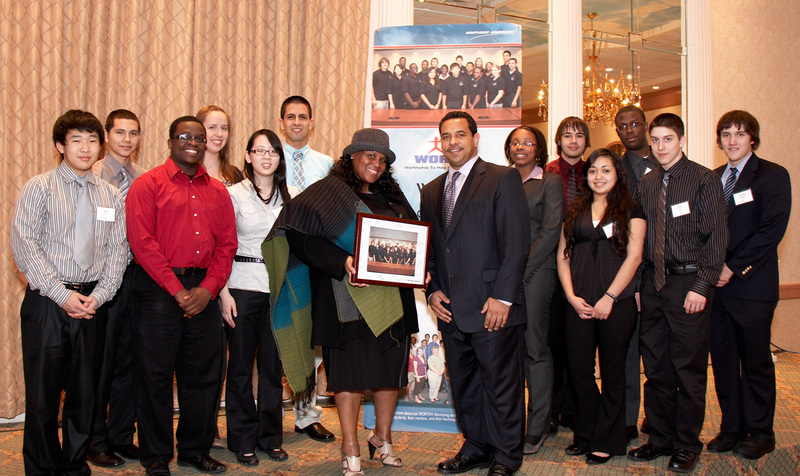 Before an audience that included students, their families, WORTHY mentors, school officials, and community leaders, Sandra Evers-Manly, vice president of Corporate Responsibility and president of the Northrop Grumman Foundation, expressed the importance of the company's continued commitment to encouraging educational opportunities in the science, technology, engineering and math (STEM) fields. "This reception affords our WORTHY students the opportunity to introduce their parents to their mentors and additional members of the Northrop Grumman family who are helping to foster their children's continued success," said Evers-Manly. "I want to commend all of the students for their hard work and commitment to learning and for striving to become our next generation of scientists and engineers. I also want to thank the parents and guardians for their love, support and encouragement of their children's academic pursuits." A total of 55 Northrop Grumman employees in Rolling Meadows specializing in business, program management and various engineering disciplines have volunteered to serve as WORTHY program mentors. This year, with the help of their mentors, the students will be working on individual projects, which will be presented at an event hosted by Northrop Grumman executive staff at the conclusion of the school year. To date, the WORTHY program has supported the participation of over 35 students and 123 Northrop Grumman employee mentors. Initially launched in 1997 by Northrop Grumman in Baltimore, WORTHY has expanded to include additional locations. The Rolling Meadows facility has sponsored the program for the past four years. To be eligible for the WORTHY program, rising high school sophomores and juniors must attend a Northrop Grumman-partnered Chicago public high school or surrounding suburban school, maintain a 3.0+ grade point average (GPA) during the course of the program, have earned a 3.0+ GPA for at least two consecutive semesters prior to applying, and must be pursuing continuing education in the field of engineering. Participants are also required to submit a three-part essay, provide a letter of recommendation from a high school counselor or community leader, and be eligible to obtain a U.S. Department of Defense security clearance. Mentors must also apply for and pass a background check.